Fortunately, I don't have to spend all day watching out the back window for cats. Bertram, Corvina, and Ned have turned out to be watchbirds and caw persistently when there's a cat in the yard. There is no ignoring the noise, or mistaking it for anything but a demand for cat mitigation measures. 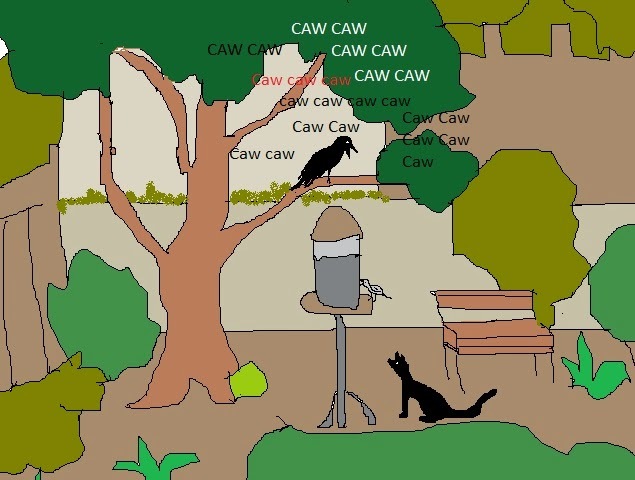 At first, the crows cawed at cats hanging out in other yards, too, but gave it up when they learned that their fuss only works in our yard. Bertram warns the other yardbirds about a predatory cat. I thought this warning behavior might be unique to "my" crows, but a couple of weeks ago I watched a crow caw angrily at a bus that had hit a seagull. The crow sat on the wire over the bus stop and cawed at that bus and every other bus that came during the 15 minutes I was standing there. Crows also take action towards predatory birds during nesting season. When hawks and eagles try to raid a crow's nest, they flock from the surrounding areas and gang up on the predators, hassling them until they give up and leave. Dr. John Marzluff, at the University of Washington, is very interested in how crows share knowledge with one another about "dangerous humans,"--humans who have trapped and banded them for research and then released them. From my personal observations, though, it isn't just humans that crows mob, but anything that represents a danger- a hawk, an eagle, a cat--or even a bus. Crows are to other birds world like German Shepherds are to people: watchers, warners, and sometimes even attackers.